ANN ARBOR— NIA grant will fund new Michigan Center for Contextual Factors in Alzheimer’s Disease (MCCFAD). The National Institute on Aging has awarded University of Michigan researchers $3,480,980 to fund a new center that will focus on the social and behavioral factors associated with Alzheimer’s Disease and Related Dementias (ADRD). 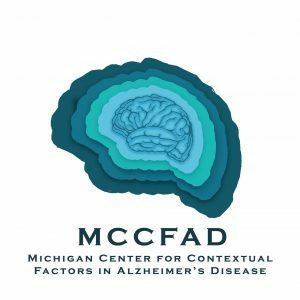 The Michigan Center for Contextual Factors in Alzheimer’s Disease (MCCFAD) will tap expertise from programs at the University of Michigan, Michigan State University and Wayne State University to study epidemiology, health economics, and culturally sensitive care in order to address the complexity of ADRD and ultimately eliminate disparities. In the tradition of research on minority aging, research at the Center will address unique and specific issues of racial/ethnic minorities, with an emphasis on African Americans, Arab Americans and Latinos. “A great deal of our work will focus on building a relationship with the Arab American communities in metropolitan Detroit and Latino communities in Grand Rapids through community health learning events,” says Ajrouch. On Saturday, January 26, 2018, the Center will hold its second event to connect with the community to provide more information and resources. Experts from the Alzheimer’s Association Greater Michigan Chapter will connect with the Arab-American community to provide information and resources in situations where one suspects dementia. This will be followed by a panel of community members who will share their experiences of what they did when they first noticed a family member had memory loss. The event is open and free to the public, desserts and refreshments will be provided. RSVP: The researchers encourage but do not require an RSVP. To register, email Donna Jawad at donjawad@umich. edu or call the University of Michigan Life Course Development Program at 734-763-4993. For more information, contact Donna Jawad.